In my work, it is the images that inspire the process, the color, the size, and the concept for the piece. The images tell the story, create the mood, and draw the viewer in for a little longer. After several years of making traditional, hand-quilted pieces, I began in the early 1990s to experiment with ways to get images into my work. That took the form of transferring images to acetate, working with a Gocco printer, and other types of transfer techniques. While often quite successful (one of those pieces was in Quilt National ’95), the limitations of the materials and size of the images often resulted in smaller quilts than I desired. 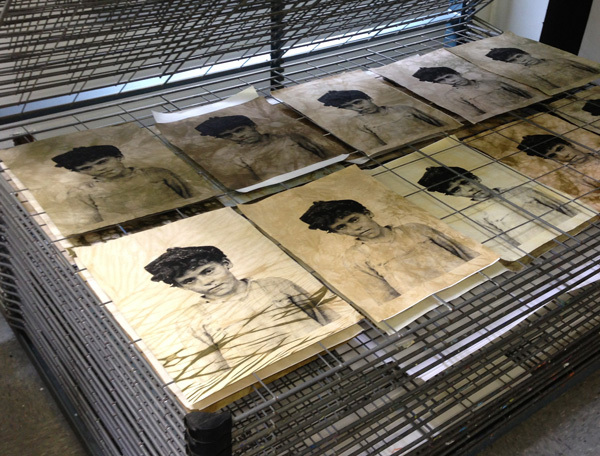 Then, in 2011, I began experimenting with dye processes and techniques to create the right background for my images. My desire to make larger pieces led me to a silkscreen tutorial at Artists Image Resource in Pittsburgh. When I pulled that first print onto my hand-dyed fabric I knew I had found my niche. The skills I learned dramatically altered the concepts of my quilts. That excitement I feel every time I screen images onto fabric has not diminished. Now my images can truly be life size, or in some cases, larger than life. 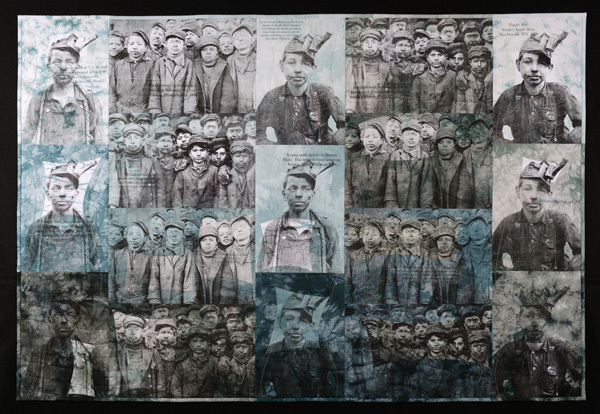 Although most of my earlier quilts used personal imagery, now I am working with historical photographs, including those of Lewis W. Hine, taken during the early 1900s as an investigative photographer for the National Child Labor Committee. Descent Into Darkness: The Boys of the Mines, is one in a series of pieces based on Hine’s imagery. I have also done pieces using the images of Edward S. Curtis, images from vintage post cards, and images by other photographers, with consent. Once images are chosen, I dye the fabrics, hoping to further express the story and set the mood I am trying to tell. In Descent, I dyed yards and yards of smokey, bluish fabrics, hoping to capture the sort of coloration I envisioned in the coal mine shafts. The fabric was then cut to size based on the final image size. I silkscreen a multitude of prints in varying hues and gradations. Accents are added, and in the case of the Hine’s pieces, words are added. These little statements were the small hand typed notations that Hine would make and attach to his photographs on index cards or paper. The simplicity of his notations, I believe, is a compelling addition to the quilt. Being accepted in Quilt National ’13 was like lightning striking twice. Winning The Heartland Award, in addition, was a remarkable surprise. The experience has encouraged me to follow this artistic path with my quilts, and given me support during the often isolating and lonely process of making art. There are still a lot of stories I wish to tell with my quilts. Sometimes the story finds me, at other times, I have the images, and my own story to tell. In either case, the viewer draws their own conclusions, creates their own story, and a memory is made. For me, that is success. 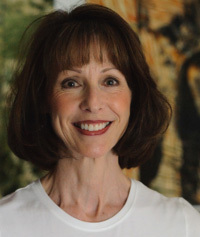 Patty Kennedy-Zafred has a Bachelor of Arts in Journalism with a Minor in Photography. Her love for the photographic image has been life long, which is clearly reflected in her work. She is a member of the Fiberarts Guild of Pittsburgh, Studio Art Quilt Associates and Surface Design Association. Her work has been included in numerous national and international exhibitions and widely published. She lives in Pittsburgh with her always supportive husband, Paolo. You can learn more about her work on her website at www.pattykz.com. Quilt National Artists is a collaborative site dedicated to spreading the news about art quilts and fiber art. Each artist who participates on this site has been chosen to show in the prestigious biennial Quilt National exhibition. All art on this website is owned by the artists. Please respect their copyrights. Copy the code below to add this button on your website. © 2013 Quilt National Artists. All Rights Reserved.